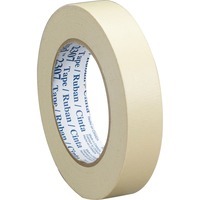 General purpose masking tape is ideally suited for holding, bundling, sealing, general paint masking and other jobs where a pressure sensitive tape is required. Rubber adhesive sticks instantly to most surfaces and offers good holding power to help resist lifting or curling. Crepe paper backing conforms over irregular surfaces and around corners. Crepe paper backing resists bleed through of most paint systems and removes cleanly in one piece.